Q. Do I really need to buy a channel strip? I often see reviews for mic preamps and channel strips in SOS and I'm wondering if I need one. I currently plug a condenser mic into a small mixer, which provides phantom power, which then goes into my M-Audio Delta soundcard. It seems to work reasonably well, though I normally have to crank the level up a bit to get a decent input. But am I missing something? Is there a good reason to pay money for a box that seems to do something I'm already able to do? Technical Editor Hugh Robjohns replies: From your description, it sounds like you are currently using a small mixing desk to boost and condition the mic signal before feeding it to the Delta soundcard's A-D converter. 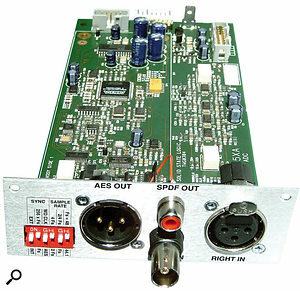 When converting an analogue signal to digital, a channel strip's own digital output board, such as the optional ADC card for SSL's XLogic channel, will often give better results than a computer soundcard.A mic preamp is simply the front end of a single mixer channel (like the one you're already using) in a convenient package. If you don't require the additional mixing, EQ and monitoring facilities usually provided in a small mixer, then a stand-alone mic preamp is often a good choice. Additionally, if you only require, for example, two high-quality mic preamps to accompany your existing small-format mixer, an external two-channel unit is a sensible and cost-effective option. A channel strip, on the other hand, is essentially a mic preamp, an EQ and (usually) a compressor, all in one box, offering facilities similar to a single channel of a large-format analogue console. Again, a channel strip is often a good choice if you need only one or two channels with those kinds of facilities, at a reasonable price. Neither would offer fundamentally more facilities than you currently have — assuming you are happy to apply EQ and compression to the signal once it's in your computer — although suitable external units could offer better quality and/or greater functionality. One other aspect that might be worth considering is that some stand-alone mic preamps and many channel strips can be fitted with optional A-D converters. This allows the delicate task of A-D conversion to be carried out very close to the mic preamp, rather than in the electrically hostile environment of a computer. Often the mic preamp or channel strip designer is able to use better components and extract better performance than is possible in a computer soundcard. The signal can then be passed to the computer as an AES or S/PDIF signal, in which form it is far more robust and virtually immune to the kinds of sonic degradations that are inherent in analogue-input soundcards.